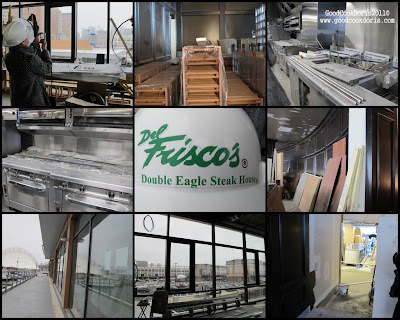 Good Cook Doris: Restaurant Week, Hard Hats, and Frites, Oh my! Thanks to everyone for their birthday wishes! I had a great week celebrating with everyone. The celebration stretched out all week with delicious eats across the city! While I'm eating healthy snacks today (it is Healthy Snack Wednesday! ), here's a look at some of the treats from last week. A big thanks to the hubby for my new camera! These shots were all taken with my new Canon G12! These pictures are courtesy of Renee and her fancy new camera! We went back forth on a list of potential restaurant week lunch spots and ended on Marliave. Neither us had been there and they had a large list of options on the menu. The dining room was bright and lovely, the server was delightful, and the portions were plentiful! Oh yeah, the blueberry crumble was so good it turned our teeth blue! 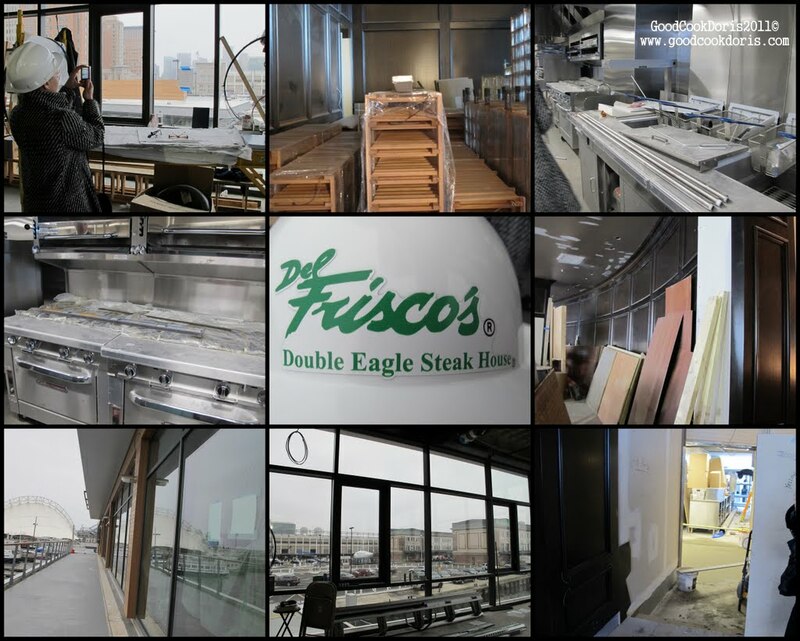 Renee worked her social media magic and we got a personal hard hat tour of the new Del Frisco's Double Eagle Steak House down at Liberty Wharf. The kitchen construction was almost done (look at those ovens!) and the beautiful mahogany wood was going up on all the walls. The general manager gave us 45 minute tour of every nook and cranny of the restaurant, including the newly tiled bathrooms. It will be fun to see how the finished space looks compared the pre-completion photos we shot. Whenever you are in the neighborhood, there is no excuse to miss a stop for pie at KO Catering and Pies. We stopped in to chat with Sam and order pies for lunch and pies for later. I enjoyed a delicious pie of the month (shepherd's pie) for lunch and took home Irish beef stew pies for dinner. This is my favorite photo that I've taken with my new camera. It was shot on my desk at work with natural light from the window streaming in. Inaugural Trip to Saus Boston for Frites & Waffles! I've been tweeting with Renee of Saus & her crew for the past year as they put together their business. It was great to stop in to see the results of their hard work! We enjoyed poutine, frites and sauces, and an incredible waffle with salted caramel sauce. I'll let the pictures speak for themselves. Frites & a fried egg. truffle ketchup, and cheddar duvel. Thanks to everyone who helped make my birthday celebration a blast! thats a lot of good birthday eats! I am dying to try that short rib french onion soup. KO and Saus are pretty much the best small business food shops to hit this town! fabulous photos! Wow, you've been busy. Fun stuff. I can't wait to try out Saus. I'm glad you've been celebrating your birthday was some great eats! These photos all look SO good! Wow! The new camera is WORKING IT! Nice! Oh my gosh what a good set of birthday eats! Those scrambled eggs! And the Saus fries and waffles of course. Glad you had a great bday!